Piracy of intellectual property is nothing new. To some, plagiarism was a problem already in first century Rome. Illegal copying of books was done long before the modern concept of copyright as a creator’s right was conceived. The right to copy during the first centuries of printing belonged to printers and booksellers (sometimes for generations), not like today when an author owns it and might or might not assign his or her rights to a publisher for a limited time. Printers often pirated books that legally belonged to other printers. The first known instance of print piracy was probably Gutenberg’s former financier Johann Fust, who reprinted Johann Mentel’s edition of St Augustine’s De Arte Prædicatoria. A more well-known case is Martin Luther, whose works were pirated in all of the German states (and in many other countries as well). There were lots of printers who for many years made their living entirely from unlicensed printing of Luther’s works. Luther complained about this, not so much on economical grounds as because the pirated editions were sloppy and the content distorted. At this time pirates even gathered at the Frankfurt Book Fair to sell their wares. 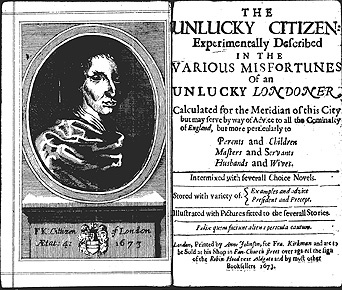 Francis Kirkman on the title pages of his book The Unlucky Citizen (1673).